Italian philosopher Giorgio Agamben is the rare writer whose ideas and works have a broad appeal across many fields, and his devoted fans are not just philosophers, but readers of political and legal theory, sociology, and literary criticism as well. 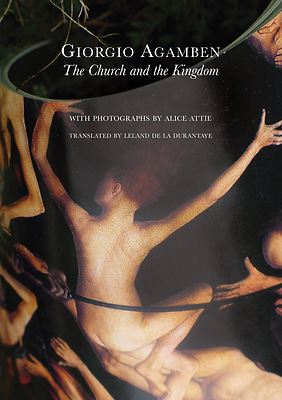 In March 2009, Agamben was invited to speak in Paris' Notre-Dame Cathedral in the presence of the Bishop of Paris and a number of other high-ranking church officials. His resulting speech, a stunningly lucid and provocative look at the history and state of the Church and its role in society, is presented here. The Church and the Kingdom is at once a pointed attack on the institutional structure of the Catholic Church and a theoretical excursus on the concepts of messianic time and economy. Presenting an exegesis of certain key passages in the New Testament, Agamben examines the philology and philosophy at the root of the Church and of its earthly reign. With its examinations of the foundational texts of the Church, which are also the foundational texts of our modern idea of economy, The Church and the Kingdom reveals significant connections and parallel ideologies which are imperative to understanding the current global situation. This edition of Agamben's text is accompanied by photographs by artist Alice Attie. Made from folded and twisted reproductions of paintings culled from Christian iconography, these works of art evoke the restless challenge that well-characterizes Agamben's four decades of philosophy and critique. This book will be welcomed by Agamben's many readers across the disciplines.